Chemistry is a foundation for success, but how do you build it over the course of a season? 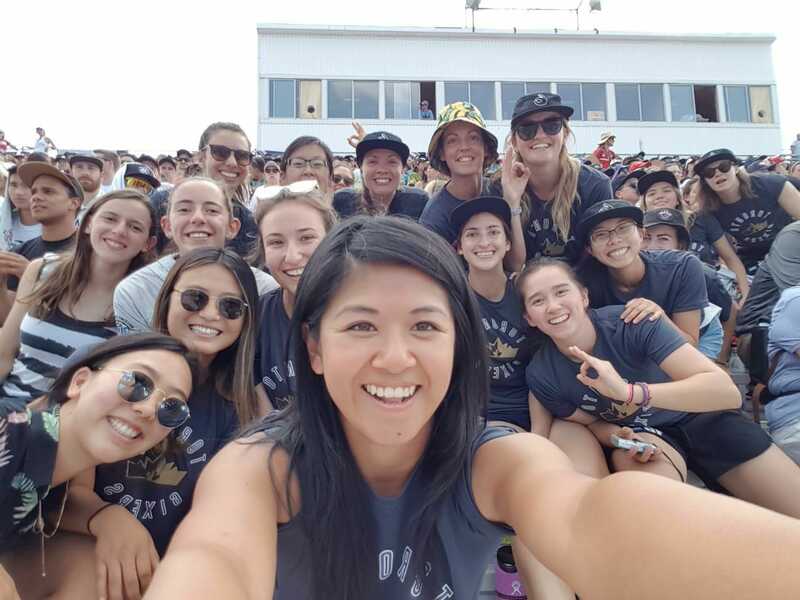 Toronto 6ixers at WUCC 2018. In December of 2017, Naomi Redmond wrote a great article on developing chemistry in the offseason. Now, we take a look at how to create that all-important, but all-mysterious, element during the course of a season. Chemistry is an ineffable quality, but an essential one. A “know it when you see it” type of feature, many of the best teams are revered for the tight cohesion they display on the field, seemingly knowing how each other will think and act without saying a word. It’s that gleam in the eye of the handler that sends you streaking to a specific spot on the field, or that instant help-switch on defense that you knew was coming, or the moment you call for no-around on the mark that generates the block. Chemistry is extremely useful, but, because it is so nebulous, it can be hard to create. Most people think the solution is simply time: more minutes and hours spent together as a unit. And while that definitely helps, time together doesn’t always translate to chemistry on the field. How then can we develop this intangible? Especially during the course of the season, when a new unit is finding its feet and trying to succeed? While some methods occur on the practice field, and others off it, the bottom line in creating chemistry is that communication is key and that you have to be proactive as a team to acquire it. Don’t wait for time to do the job for you; use as much of the offseason as you can, and then start in season developing team chemistry from the bottom up. The first thing to realize about team chemistry is that it is almost always based around unspoken communication. And while this may at times feel like extrasensory perception, the best way to create such an effect is actually to over-communicate to start. Talking to your teammates about any given situation is more likely to give you a clear picture of how they will react when it occurs. This then allows you to respond accordingly. For example, knowing that when your teammate is defending someone streaking deep, the first thing she’ll do is look for help, you can be ready to sag off and step in as that defender, even before she can call for it. Practice game situations, whether walk-through or full-speed, on the field. Set up a situation, tell players where to go, and then run it quickly. As soon as the situation plays out, have a new group come on the field, while the old group goes off to talk about it. This is the time to over-talk and over-analyze (making sure every person gets his or her turn) so that in the future, you can quickly and easily use cues to do the same work. Repeat your game situations a few times, increasing the speed and complexity with coaches or captains picking tough spots on both offense and defense. Go for those in-between, not-so-obvious moments where there are a few options available for players to react. Remember, the key is getting a read on how any one individual prefers to respond. Film sessions allow leadership to analyze a moment in the game several times in a row and be clear about their intentions. Ideally, use real game footage from previous tournaments or matchups, or film practice scrimmages or drills. Start with one voice in the classroom to ensure the basics are met; one leader should determine how the players should respond at a basic level. Then, however, open it up to the group. Break teammates into pairs or small units, especially those that will be playing together often. Then ask them to build off the initial read of the play, and encourage them to explain their thinking in what they would or wouldn’t do specifically for themselves. A throw-and-go handler might not have made that huck choice, for instance, but instead let his teammates know that he would have tried to break the mark for a big out-to-space swing. Chemistry is about diverse preferences and tendencies gelling together into anticipated response. At an even more basic level, great chemistry can be developed between just a few people before or after practice (or outside it entirely) during a discussion throwing session. Discussion throwing isn’t about improving the throws of one person—it’s about explaining them to another. This is the time to share specifically one person’s favorite (and least favorite) throws in the game. A big backhand huck? Make it clear. Favor the forehand IO break? Practice throwing a few to a moving partner. Don’t like your high release? Explain why and provide another idea of what to do in a bailout situation. Often this paired throwing, done a few times over the course of the season, is enough alone to increase an offensive connection greatly. Chemistry doesn’t have to be all ultimate-related. Some of the best off-the-field ways to increase it are to spend time productively partying or hanging out with teammates. However, if chemistry creation is really the goal, then be proactive and don’t just sit and chat. Instead, come up with a few strategic games to play. Whether it’s Settlers of Catan or Twenty Questions, seeing how your teammates react in different competitive situations is bound to be useful. Encourage table-talk and thinking aloud. Genuinely question people about their motivations and moves. It can be very useful to see how people plan and act. You’ll learn a lot more about how cautious or aggressive someone is, how they tend to think, and therefore will be more likely to anticipate their next move. Just like a poker player, every ultimate player has a tell or two and can be read when focusing on their behavior. Chemistry as a large unit is a very difficult thing. After all, a big team might have almost 30 players! That’s a lot of different personalities to learn about and figure out how to work with. As a result, it can be a lot easier to create smaller groups within that big unit. Establishing crews or pods can be a great way to do this, and it has the added benefit of making a support team for individual players. All the additional time talking, reflecting, and having fun will definitely increase the chemistry of that group, which will extend to the rest of the team. Working on your mental game can be just as important as your physical preparation, whether it’s anticipating a superior matchup or building up mental toughness. Working with a mental health coach or sports psychologist can be a great benefit to the team’s overall state, but it can also improve chemistry. Many people have different ways of wanting to communicate off and on the field, as well as situations where they thrive (or fail). Trying to jack up a teammate by yelling at him, for example, might instead turn him off and shut him down. Likewise, giving space can be just as bad for someone who struggles to escape a thought spiral. Have open discussions before or after practice as a large group or with teammates on what works best for you on and off the field. Being clear and reflective about team and personal goals is a great way to build camaraderie, while knowing exactly what makes a person ready to play at their best is key to team culture and success during games. There’s a reason schools, camps, and companies do offsite trips or ice-breaking getting-to-know you silliness. Team-building activities work and these are great in-season activities to start a practice or to do during a film or strategy session to make the team better. These activities thrive on two things: knowledge and trust. Each stems from the other, and you need both to fully have good chemistry. First, try to learn as much about someone as you can, to build a better picture of that individual and use your knowledge in the game. Knowing exactly what the person’s spirit animal is (and why it fits) may seem unnecessary to the game of ultimate, but it can be a great segue into knowledge on the field. If you’re on defense with a bulldog player, you’ll know she’s gonna be gruff, tough, and never give up. Trust is absolutely important in good team chemistry, as well, and is essential for those split-second decisions like right before an important back shoulder throw or defensive bid. Build trust and knowledge in whatever way you can, and don’t be afraid to do the fun activities to get it in action. Offensively, the best thing you can do to create what seems like legendary chemistry is just to have extremely well-practiced and well-prepared sets. A great play might seem like perfect timing and chemistry to an outsider, but a true insider knows exactly what will be happening and when. They know each of the steps because they’ve run this until it’s second nature. Practice running cutting strings (cuts in a specific order) to get players used to knowing who to throw to and when. This will also help get a feel for knowing which throw is more viable (based on the player) and what tendencies in fake, pivot, or reach a player has. Learning that your handler friend does indeed have that step-around is critical for you to know to cut there. Developing the knowledge of who goes where is just the first step, while internalizing the rhythm and body mechanics of muscle memory are just as essential. Working in pairs is great inside practice for chemistry purposes. There are two ways to do this. One is to have a pair set up, but only one person goes through a drill or situation (or is on the field) at a time. This forces the other person to watch, listen, and communicate as much as possible. These two are in effect a team throughout the practice (and feel free to make every drill set up this way into a true contest with rewards or punishments). The observation allows learning from and about each other, while the communication and competition builds strong rapport. A second way is to put the pair on the field together throughout practice and the drills at the same time, always keeping them side by side. The increased contact will ensure they again get that feeling of competitive edge for their paired team, while also giving them lots of throws and catches to one another. The more touches back and forth, the more likely tendencies will be seen and anticipated. The last and best way to build chemistry to ask the impossible of your squad as a whole. Create a tough team workout at the end of a practice or make the squad face off against a nearly impossible skill challenge. Ask for perfection or close to it and make them try to achieve it. An every-single-person-against-the-clock relay race or nearly-flawless catching and throwing drill—whatever the category, it doesn’t matter. What does matter is that your squad was forged by fire in the course of the season, making the chain strong and hard to break. Comments on "Tuesday Tips: 10 Ways to Build Team Chemistry In Season, Presented By Spin Ultimate"